Alp from SunGurtekin Design & Fabrication in California is an industrial designer specializing in transportation design. 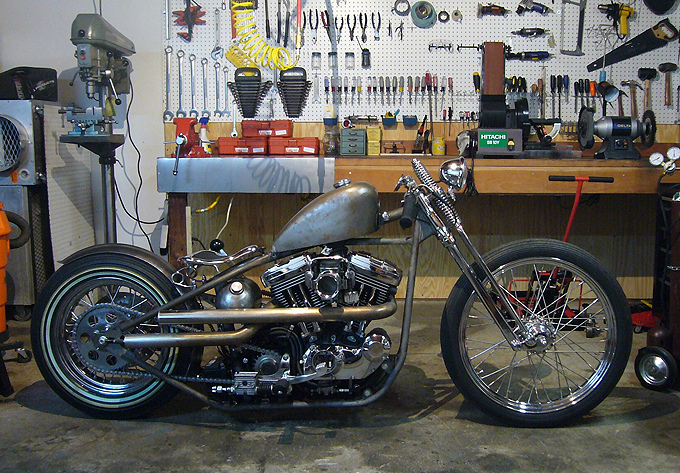 He built this low and mean hardtail Harley Sportster which he has appropriately named ‘The Whip’. “I designed the Whip with the unusual jockey shifter and clutch set up” Alp says. “My goal was to achieve a clean look where all the components on the bike look smooth and balanced. I ran all the wires and brake lines inside the frame to achieve that clean look. For me the most important aspect is the stance: if there’s one thing most of my cars or bikes have had in common past and present, it’s that they’ve got to be slammed. The Whip is no exception. 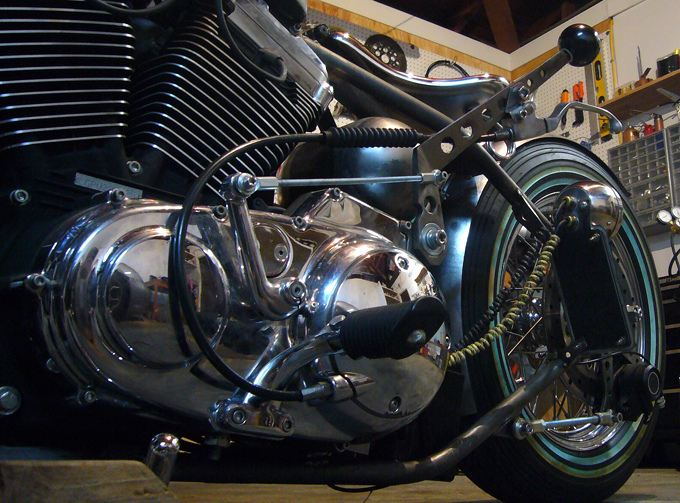 Some of the major features that contributed to the overall low-as-possible-stance were: the pipes I fabricated with 2” diameter of stainless steel and the oil tank designed so it surrounds the frame tube and fills the gap evenly between the rear fender and engine. I also used an aftermarket single fire ignition system and eliminated the huge stock ignition module which couldn’t be fitted onto this bike. The seat is forged out of one piece of metal connected with hairpin seat springs to the frame, which adds weight to the overall look; the gas tank is a pre 80’s sportster peanut tank and the handlebars are custom fabricated and welded onto the top tree to keep them as low as possible”. If you want to see this unique jockey shifter in action check out the video Alp made of his masterpiece on the move.